The John Barras chain of public houses is installing calculators beside its darts boards. Declining standards in mathematics have left younger players unable to do the sums, the chain claims. Darts is fantastic for honing your maths skills. 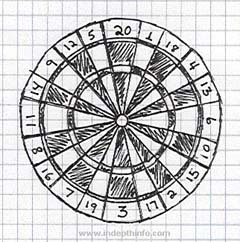 They should introduce darts calculations into the GCSE maths syllabus. … although, like so many, Phil "The Power" Taylor jumps from "X might be a good idea", to "X should therefore be compulsory". But this habit is an educational defect shared by many more persons than Phil "The Power" Taylor.